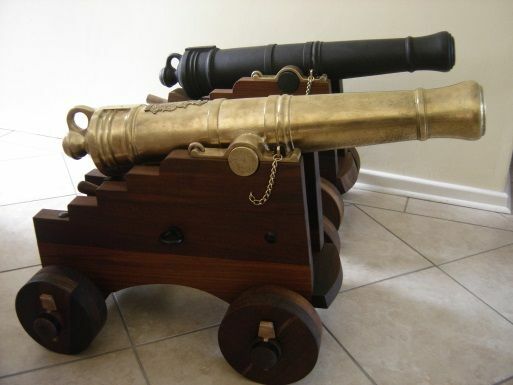 This chapter of my life began when I found this two pounder cannon when I was at a braai (barbeque). I met a photographer who said he had a cannon at his poolside. 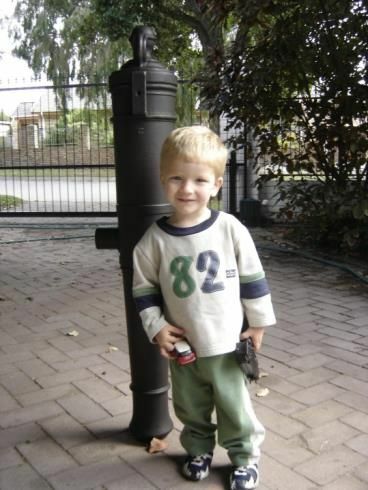 He was moving to Spain and wanted to sell it so I bought it and later sold it. Regretting the sale I decided to make my own 1 pounder in bronze. The first thing is to get a good drawing to work from when you make the pattern. 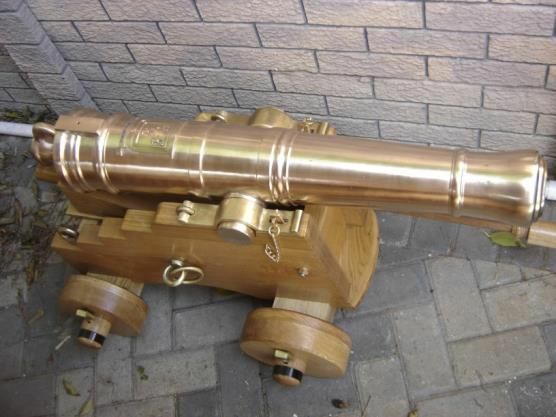 Luckily I had received a CAD drawing of the 2 pounder gun that I had just sold from the person to whom I had sold it to. So the pattern was made to a 1 pounder scale as cannon balls could be bought from the local metalsmith shop who sold them to people making gates and decorative metalwork. 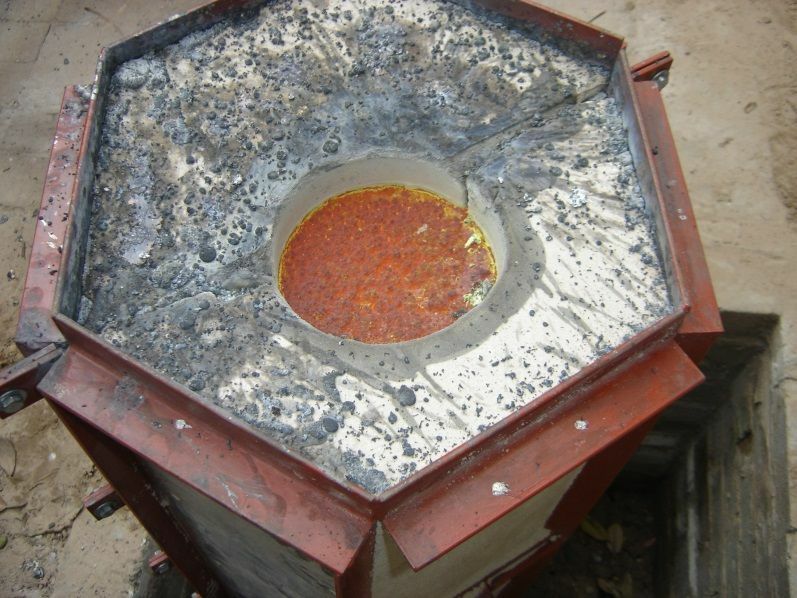 The mold is made from silica sand mixed with sodium silicate and hardened with carbon dioxide gas. 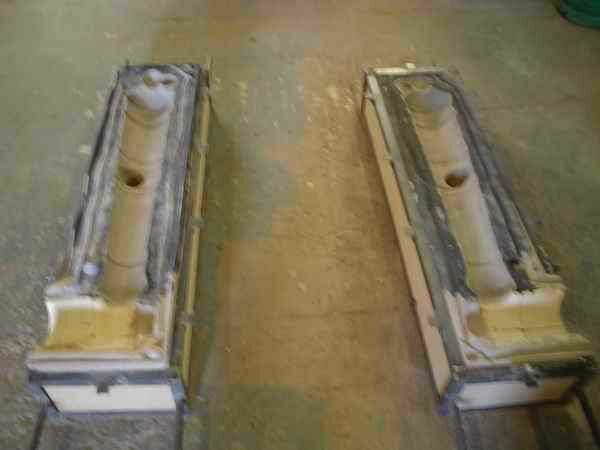 The mold box is made in two halves (The Drag and the Cope). I just used angle iron and line it with wood. 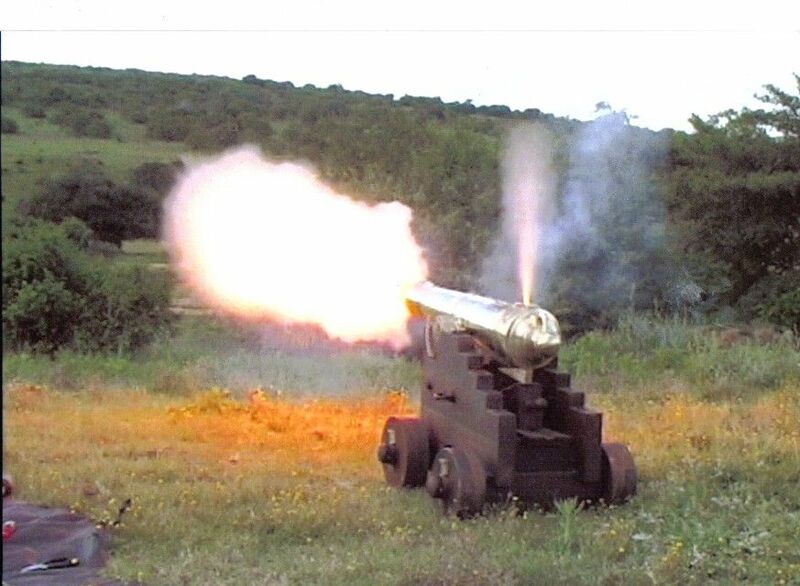 The trick is with casting a cannon is that the barrel must be cast in a verticle position with the ingate at the muzzle. When molten metal get cold it contracts and must be replaced with hot molten metal or shrinkage defects will occure in the casting. Areas with small volume will freeze before the bigger volumes so a deadhead is provided to supply molten metal to the casting. This is the area above the muzzle on the casting. Being verticle is also good as the weight of the metal pushing down will help to reduce shrinkage cavities forming. If the gun is cast in a horizontal position then the muzzle and the trunions will freeze before the breech volume. The supply of molten metal will stop and cavities will form. 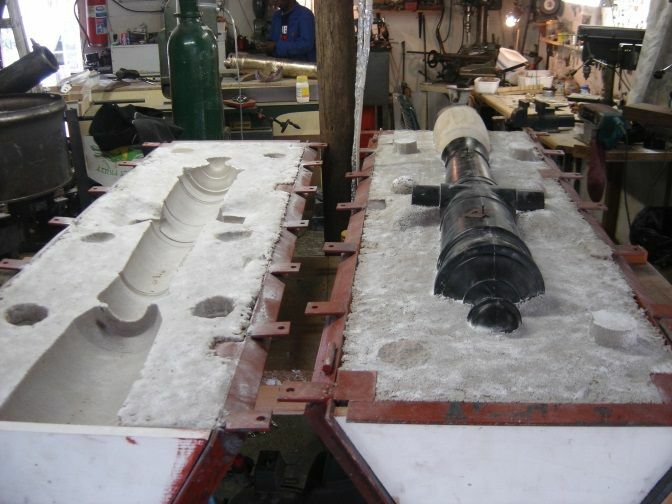 A well designed cannon mold. The open mold, showing the inside coating. This is made of graphite and alcohol which is used to seal the sand and prevent the molten bronze penetrating the sand. The inside of the mold is painted and then the alcohol is burnt off. 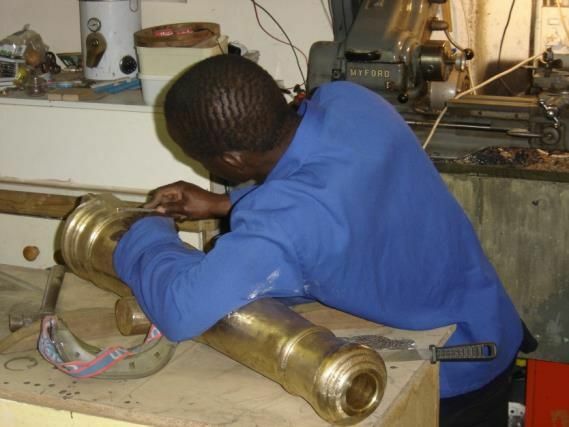 There cannot be any liquid in a mold or defects can cure or the metal can blow back out the sprue. Normal baby powder or graphyte is used a parting agent to separate the 2 halves of the mold. This mold is a disaster. I arrived at the foundry in time to see the pour. 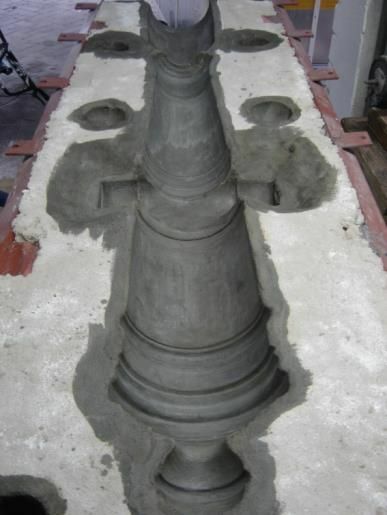 The cannon was slightly elevated and the mold made as shown. When the casting was delivered to me it had been repaired with metal from the cast used as filler and TIG welded. No defect could be seen until after firing the gun. It pasted a proof firing but later started to leak at a trunnion. Further inspection found shrinkage defects inside the trunnion into which I could fit my thumb. I then decided to cast my own. The vent area also showing areas that had been TIG welded to cover or repair shrinkage defects and now starting to change colour as it is heated over my furnace prior to being introduced into the crucible. This help to dry the metal and use otherwise wasted heat. 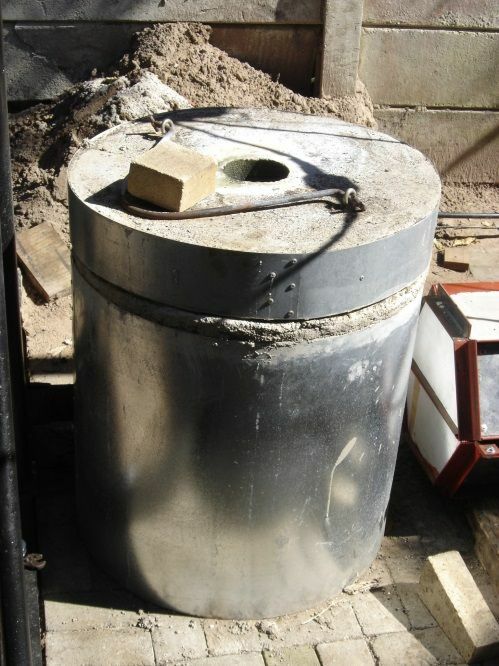 The furnace that I used was made by myself and designed it to be run on liquid gas and to fit a crucible that could take 150kg’s of metal. The flame was impinging at an angle to the crucible causing the flame to wrap around the crucible and to have the maximum contact time. This worked well but it still took a big bottle of gas to metal 150Kg’s of bronze. The brick on top is used to baffle the gas flow leaving the furnace. This can be used a a kind of regulator of temperature. De-gassing and de-oxidizing the melt. There are 2 problems that can arrise during the melt. The first is oxidation of the metal and can result from metal with a large surface area to vilume ratio like metal shavings. Glass can be used as a flux to seal the surface of the metal from contact with the atmosphere. The second is the absorption of hydrogen which comes from water in the air or from hydrocarbons in the scrap metal. These are readily dissolved in hot bronze and you will not see any signs of it until you find your casting is full of porosity. Best to avoid getting it by using clean metal. Secondly you can get degassing tubes that contain some elements that when plunged into the metal react to remove hydrogen and deoxidising rings to remove Oxygen. These must be placed on a plunger and completely submerged in the molten metal before the pour at around 1200 degrees celcius. 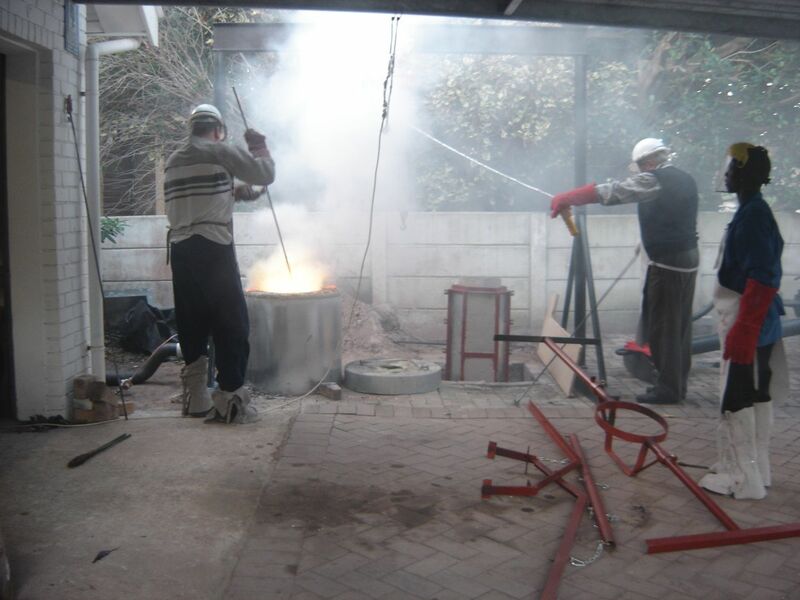 You will see when the metal is ready to pour with a little experience. An expensive digital temperature gauge is not required once you learn how to read the molten metal. TIP – before placing or re-placing the crucible in the furnace after cast your bronze cannon , place some cardboard below the crucible to prevent it from gluing itself to the furnace floor. Before you pick up any red hot crucible, ensure that your lifting tongs are strong enough to lift the crucible when they get hot. This happens really quickly and if this pot drops you go to hospital. 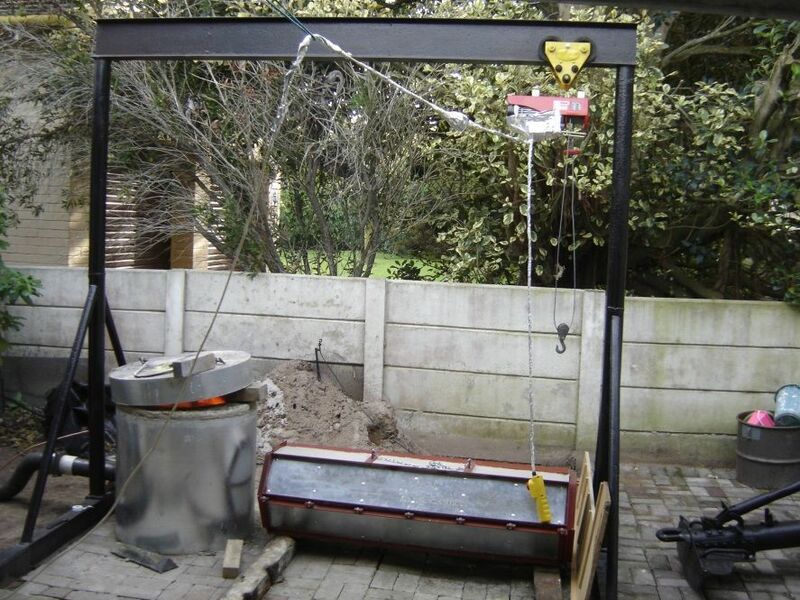 Make sure that the tongs will not break the crucible as the weight of the molten metal in the crucible helps to close the tongs and with the crucible meterial being very hot, it is also softer. 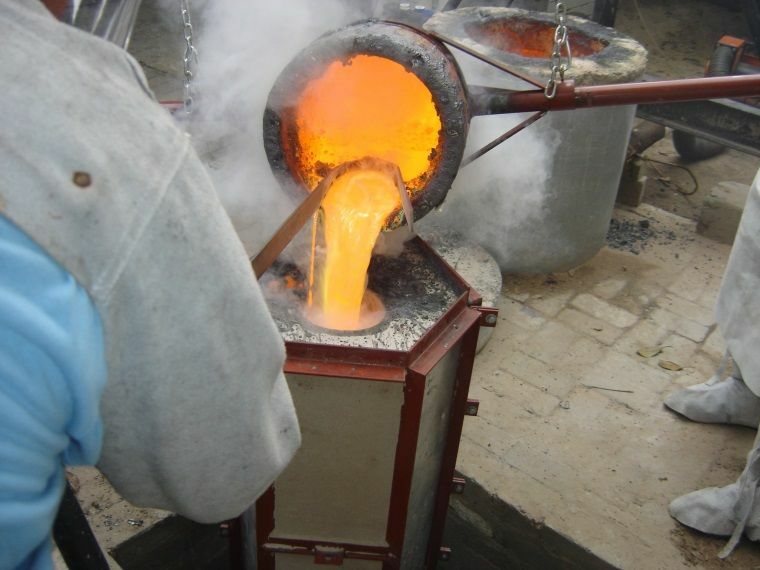 During the last cast that I did I saw the crucible bend from round to oval when the tongs raised the pot and I realised then that if this breaks the pot we would be in serious trouble. 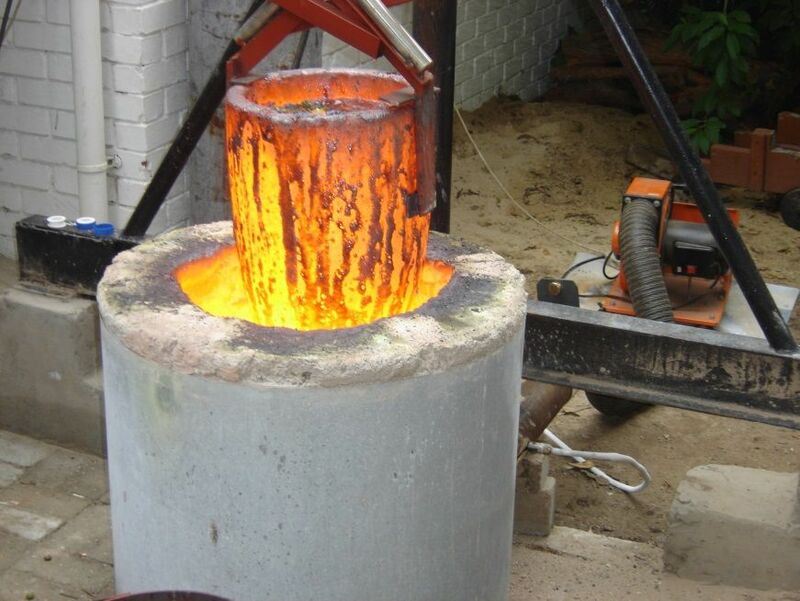 Molten metal when dropped reacts the same as mercury does…it goes in every direction and will cause fires where ever it goes and it will move very fast. The heat coming off this crucible is enough to make my leather apron smoke, so ensure that you have padding underneeth to retard the warmth from getting to you. One cannon cast in the vertical position as it should be. 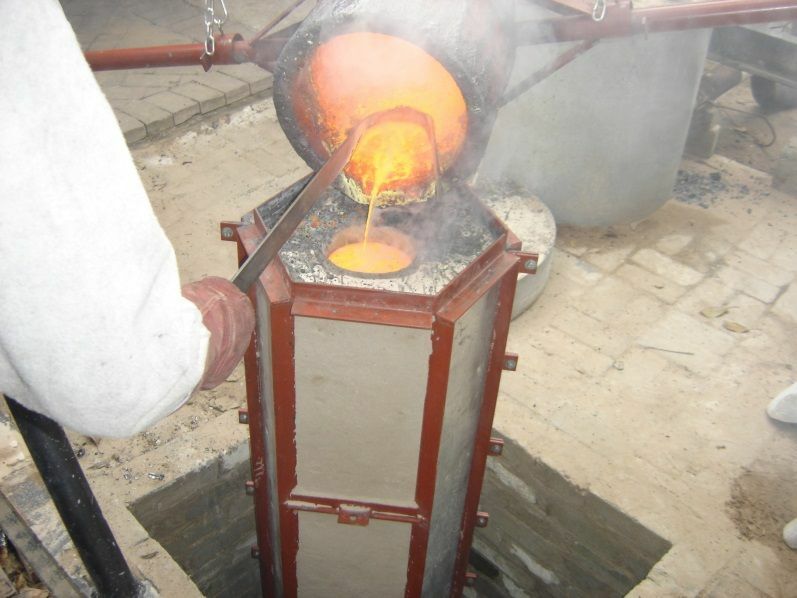 Note the use of a casting pit to reduce the height that was required to lift the crucible and slightly reduce the risk involved. A good casting like the one shown above will result in the dead head surface sinking as it cools. This means that metal is being drawn into the casting to replace shrinkage losses. Carbon pieces can be dropped onto the surface here to prevent heat loss. You need this to be as hot as possible for as long as possible. If the surface rises it means that you have oxygen and hydrogen dissolved in the molten meltal. As it cools it forms water H₂O in the form of steam. This pushes the metal upwards or prevents it from drawing. This is not a good sign and your casting will be pourous. Do not be in a hurry to get the casting out of the mold. 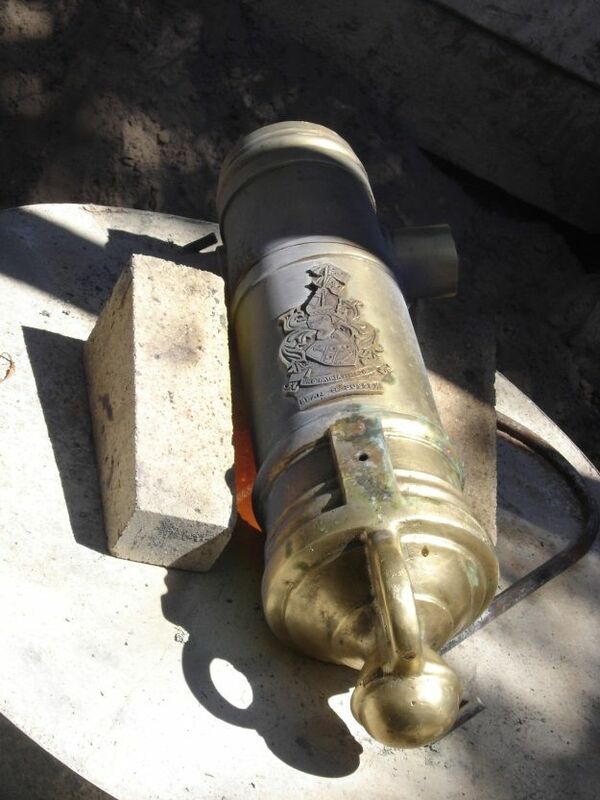 This bronze cannon barrel was left more than 12 hours before being removed from the mold and is still to hot to touch. The dead head can be seen at the cannon muzzle. Fettling of the casting took 3 to 4 days and required a lot of filing. Just a note – when you get the barrel drilled out make sure that the engineering company has the correct drill and that it is sharp. Rather buy the drill that you want them to use to bore the cannon barrel. Also do not forget to give an accurate drawing to them that they must sign and you keep a copy or you can have them drill it to the depth that they felt is correct and then you have a piece of expensive muzzle loading scrap. This was a lesson that I learnt the hard way and thank goodness I covered myself and was able to get at least most of my costs back but profits were lost. When drilling the touch hole in your cannon barrel, don’t take a chance and drill it free hand. 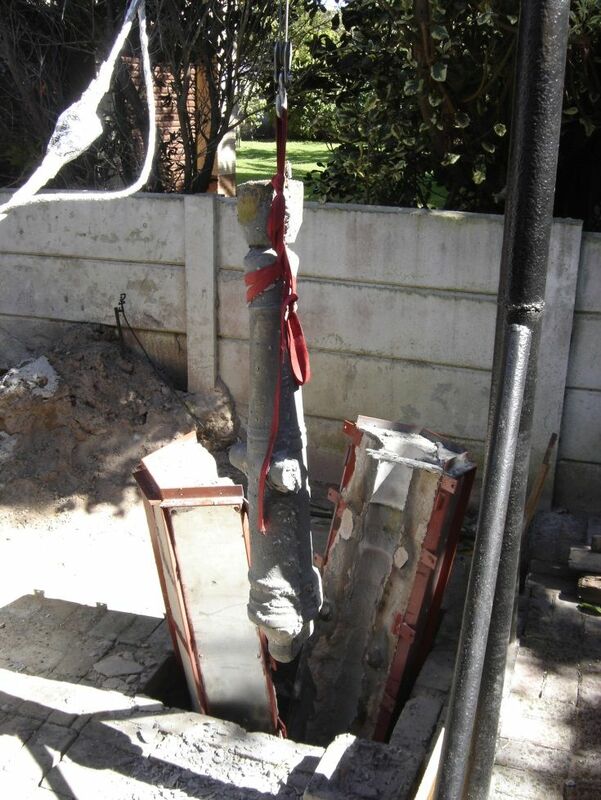 You will break the drill when the barrel moves and the drill bit will not come out without spark erroding it out. The finished cannon on its oak carriage. An absolute hate of mine is to see a cannon that has taken a lot of time to make, being made without an original drawing being used. It just seems like such a waste of time to make something that is ugly when there are drawings available. (beautiful to the person who made it?) Why not Google it first and get some idea of the proportions and print a carriage plan and work to that. The brass fittings and brass monkeys. 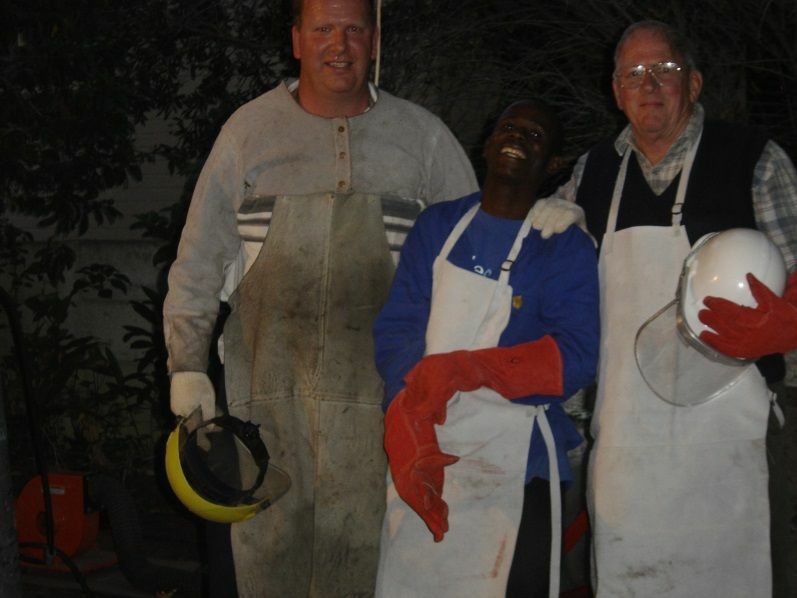 The team in action casting the bronze cannon barrel which took around 3 hours to complete. Lifting tongs and pouring ladle in the picture. Also in the picture is the trail of my 13 pounder. Proof of the pudding is in the firing.